1 Preheat the oven to 200°C (180°C in a fan oven), 400°F, gas 6 and line a baking tray with grease-proof paper. 2 Roll out the puff pastry, if not pre-rolled, to a thickness of 3-4 mm. Cut out 12 circles (diameter 8-9 cm). Cut a hole (5-6 cm in diameter) out of the centre of 8 of the circles to form rings. Put the 4 complete circles on the baking tray, prick a few times with a fork, brush the edge with water and place one ring on each circle. Brush with water and place a second ring on top. Press gently, brush with cream and bake for around 15 minutes until golden brown. Remove from the oven and leave to cool. 3 Cut the tips off the asparagus (approx. 10 cm). Peel the white asparagus and halve all the stalks lengthways. Bring a pan of salted water to the boil with the sugar and the lemon juice. Add the white asparagus and simmer for around 8-10 minutes until cooked. Add the green asparagus after 5 minutes and finish cooking together. 4 For the sauce, melt the butter in a pan. Beat the egg yolk with the wine in a bowl over hot water, take off the heat and stir in the melted butter, initially drop by drop, then in a thin stream until you have a shiny, smooth sauce. Stir in the herbs and season to taste with a dash of lemon juice and salt. 5 Arrange the pastry cases on plates and fill with the well drained asparagus. 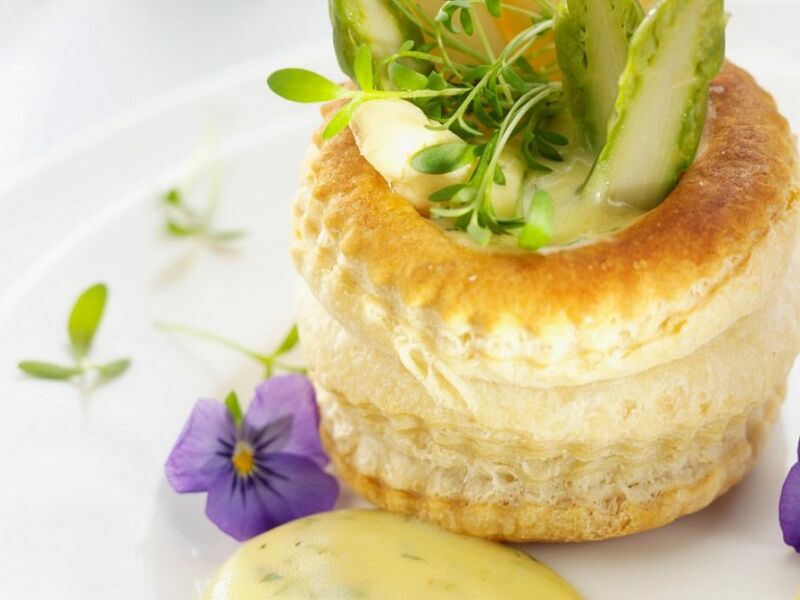 Drizzle a little sauce over the top and on the plate and serve garnished with cress and pansies.